I started working for Carnegie Robotics LLC, Pittsburgh, Pennsylvania, USA, from July 2015. I definitely think that the shift in perspective from building prototypes to building commercial products is not only a big step to make but also a difficult one. Making this step, however, is also very important. 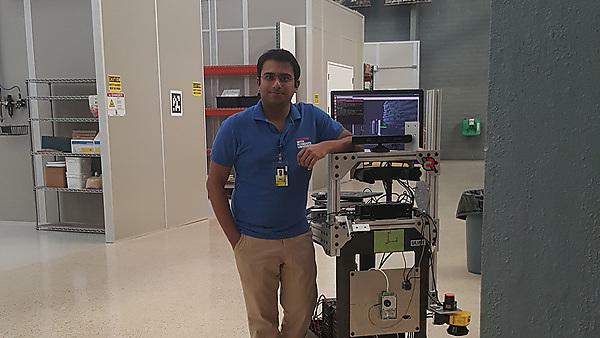 The best part of my career to date has been testing and evaluating several 3D sensors, LIDAR sensors, and inertial measurement units (IMU) for a commercial robotic product. In addition to this, I also really enjoyed the research and development of a new sensor technology. You can’t learn robotics just by reading books: you have to learn by doing. Studying at Plymouth University gave me a glimpse into the breadth of robotics. The research skills I picked up during my time at university are very useful in my work today. The degree from Plymouth University and my other degree from Carnegie Mellon University have given me the knowledge and skills to build cutting edge technology (robots). I really enjoyed being able to build robots whilst at university, and learning all the ins and outs of programming. My favourite memory about the locale is definitely the opportunities I had to go on a walk to the sea-front. Definitely! The robotics programme offered at Plymouth University is one of the best in UK. The breadth of knowledge combined with the up-to-date and practical projects we covered during our coursework prepares students for their career in robotics – a field that requires one to be always up-to-date with technology. Hack-a-thons and mini-projects, along with strong understanding of fundamentals, is very important for a great career in this industry.